These are three separate and distinct areas - an old village area, a holy mountain, and a mega city with a picturesque lake, respectively. Individually they are each worth a visit but when combine into a multi-day itinerary it's one of the most impressive stretches in China and makes for a great add on to a trip starting or ending in Shanghai. Wuyuan is about a six hour bus ride from Shanghai but it feels that you are a world and different time period away. From the Wuyuan bus station it's about a twenty minute motorcycle ride to Little Likeng - an idyllic, ancient Chinese village. Little Likeng is managed by the Wuyuan Jiangxi Tourism Department so you to need to pay 210Y to enter this and villages in the surrounding area. Little Likeng has two streams that merge to form one at the village entrance. I walked along one stream to the end of the village where gardens and rice terraces were kept. To reach other villages I arranged for an all day motorcycle tour. It was nearly an hour motorcycle ride to the first village - Rainbow Bridge. The highlight of this stop wasn’t the namesake bridge but instead a series of rice terraces at the far end of the village. There wasn’t a well defined path but it was a natural walk through the terraces. The next stop was Sixi Yancun. This village had a few more buildings but a slightly commercial feel. All of the villages had stores that sold similar handicraft items - combs, wooden block frogs, this chicken string thing my mom has in our kitchen, etc. The first stop after a midday lunch was Xiao Qi . This village had a row of stalls I needed to pass through before crossing a bridge to the village. The village had a similar commercial feel as Sixi Yancun but was larger in size and had several historical mansions you could walk through. The final village was Wang Kou and I liked this one the best other than Little Likeng. The village ran for about a mile along a river and I walked the entire footpath and popped my head into a few homes and older “mansions”. One of the homes had a huge poster of Mao and a couple in their 80s watching TV. Most of the other homes had a Taoist or Confucian god in the center of the main room. At the far end of the village from the entrance was a courthouse style building. The building was very open and followed a similar construction pattern to the mansions - stone walls but with a wooden facade creating a decorative effect on the inside. The courthouse had carvings of the town along the corner of the ceiling. Huangshan Mountain is considered one of the holiest mountains in China - it's beauty has inspired Chinese poets and artists for hundreds of years. Huangshan City is about an hour away but the mountain is still reachable via a day trip from this small town. Huangshan City has a main commercial street - "Old Street" - offering the common Chinese tourist staples - candy, meat on sticks, etc. - but this street has a proliferation of tea shops selling the "famous" local tea. To reach Huangshan I caught a 6:30 mini bus - it's about an hour ride to Tangkou a small village at the base of Mt. Huangshan. From there you need to transfer to another bus that continues for the final twenty minutes to the park entrance - this bus is a bit of a cartel as it’s the only way you can reach the park entrance - the final twenty minute ride was more than the one hour minibus ride. The skies were a bit overcast so rather than walk to the top in a drizzle, I opted for the Chinese approach and took a cable car. When I arrived at the top the rain was falling a little steadier and the first few viewpoints - one of which claimed to be the best viewpoint for Mt. Huangshan - were covered in clouds. Through the fog I could catch a glimpse of what may be behind the thicker clouds and the mountain appeared similar to Zhangjiajie only instead of the spires rising from a canyon below it was a limestone mountain with a few trees on the side. After reaching the summitt, where the rain and wind were the fiercest, I started the walk back down. The walk down was pretty intense. Along the top and the summit area you’d briefly walk through an open area and the wind would come racing up and over the mountain bringing with it a stream of water. There was about a 100 foot walk down the mountain that was completely exposed - if you think Asian tour groups are bad try being stuck behind several tour groups, in pouring rain and typhoon like winds, walking down an exposed side of a mountain with a steep drop below and a 70 year old is leading the way. I eventually made it to a protected area and look back up and even in the pouring rain and fog you can clearly see the beauty of the mountain. The rest of the hike down went pretty smooth. Once I reached a lower level I was no longer walking in the clouds and the rain stopped. I took of the poncho and while all my belongings were dry my shirt was soaked with sweat. At the base of the mountain I caught a bus back to the bus station and transfer to another bus heading to Huangshan City. It was raining when I arrived at the hostel so I stayed in and practiced some Chinese. Hangzhou is considered one of the most beautiful cities in China. Even Marco Polo commented on it's beauty when he supposedly visited the city during his Chinese travels. 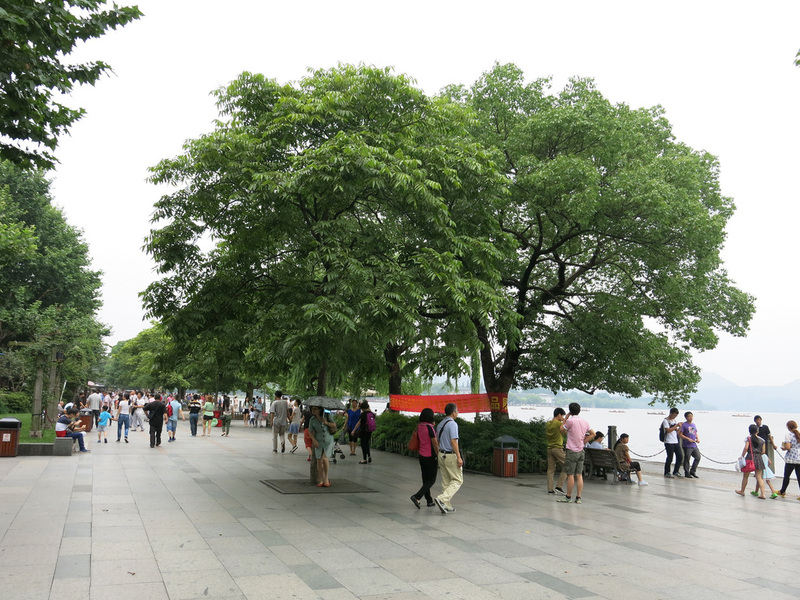 The City's beauty can easily be seen during a walk around the West Lake. Along the lake promenade dancers and musicians gathered to enjoy the nice weekend weather. It takes about four hours to walk around the lake - I stopped at Liefang Pagoda but otherwise walked straight through. There were a few places to stop on the far side of the lake but most of the cafes and restaurants are situated along the eastern side near the city center. One of the best restaurants in The Grandma’s - a Hangzhou institution that has grown from a single restaurant to a chain of twenty. The concept is that the food is what your Grandma would cook - but if this is what Chinese Grandmas can cook I don’t know why everyone isn’t heading to her house every night. I ordered Hangzhou Soup, Rice Cakes, and Garlic Shrimp. The food was good and had a very sophisticated presentation. The area I stayed in was near an imperial Song Dynasty refurbished area. Despite the thirty minute walk to the West Lake area it was an interesting area to stay. There were pedestrian streets with cafes, restaurants, and shops. One cross street had the same set of tourist shops I’d seen in Fenghuang and Huangshan. The best street food is in the Song Imperial Dynasty area so I picked up a stick of three deep fried crabs. From what I could see the Chinese were biting into the crab and eating it shell and all. I took one bit and decided that wasn’t going to work for me so sat down and a table and pulled out the meat. For additional Wuyuan photos see FLIKR ALBUM. For additional Huangshan photos see FLIKR ALBUM. For additional Hangzhou photos see FLIKR ALBUM.